Robert J. Sawyer hardly needs an introduction. The Hugo, the Nebula, the Campbell, he’s won them all, one of only seven writers in history to make that science fiction hat trick. And that’s not even mentioning the multiple Seiun and Aurora wins and his genre-crossing Arthur Ellis Award from the Crime Writers of Canada. With the success of Battlestar Galactica and Lost, science fiction seems to be gaining in popularity in the mainstream media. Do you think the genre is experiencing a renaissance or is it just that people are beginning to feel like it’s ok to come out of the science fiction closet? Sawyer: Well, you’re talking apples and oranges. In a really good week, Battlestar Galactica, on tiny cable channel Syfy, had one million viewers in the US—out of 300 million people. Lost had well over ten million in a good week, but most people watching Lost had no idea they were watching science fiction. So, it’s anything but mainstream acceptance. In fact, look at FlashForward, the ABC TV series based on my novel; the novel is unequivocally science fiction. All of the major changes made in adapting the book were to downplay any visual clue that it was science fiction for people flipping channels: instead of physicists working at CERN, you saw FBI agents working in L.A.; instead of flashing 20 years into the future, you never saw any futuristic skylines or technology. So, I guess I reject the question’s premise. As much as we who love SF wish it were true, I feel that SF fans have come down with what used to be thought of as a purely Canadian disease. We Canadians go around saying stuff like, “Pamela Anderson? Oh, yeah—she’s Canadian” or “Jim Carey—did you know he’s from Toronto?” It’s a thing we do out of pride, but going around saying, “Hey, you like Lost—did you know it’s science fiction?” or “Oooh, your book club just did The Time Traveler’s Wife—are you going to do any more SF?” is just fooling ourselves. Sure, Avatar is the biggest grossing movie of all time, but, come on, we no more own the box office than Canadian athletes owned the podium in the winter Olympics. Your own work tends to straddle the science fiction and mystery genres, but do you think we should even have labels? Do they help or hurt? In the United States, they’re a necessary evil—so many books are published, they have to be organized somehow for browsing. But in general, they hurt. I’m proud to call myself a science-fiction writer—my website is sfwriter.com and my car’s license plate says SFWRITER—but in Canada, I’m mostly thought of as a writer, period, and my audience is much, much wider than it is in the States. It’s similar to what we were talking about in your previous question: there are way, way, way more people who read Michael Crichton, Audrey Niffenegger, or J.D. Robb than there will ever be readers of any writer published as science fiction you care to name. A lucky few have left the category—William Gibson is no longer published as SF—but mostly if you start there, you’re stuck there. Oh, we may be able to see, and understand, the stars better than just about any other writers alive, but there’s a definite glass ceiling on our sales, imposed by the simple fact that 95% of book buyers never, ever go into the science fiction section, because they can’t imagine it holds anything of interest for them. How was it watching your novel FlashForward made into a TV series? Changes always need to be made in order to adapt a novel into a movie or TV show. How do you feel about the changes that were made to FlashForward? Before I optioned the rights to them, I sat down in Los Angeles with executive producers Jessika Borsiczky, David S. Goyer, and Brannon Braga. They told me what changes they felt would be necessary to make the show work for a major American TV series. If I hadn’t liked what they’d had to say, I could have said no, and turned down their offer. But I did understand the logic of what they felt needed to be done. In retrospect, of course, we didn’t have the success we wanted: the show only lasted 22 episodes. But I’m not going to play Monday morning quarterback; despite our subject matter, we didn’t know what the future held. David Goyer and I used to have quite spirited discussions on some points, and I guess I won the arguments about half the time—which is fine. I consulted on every episode, wrote the nineteenth episode, made lots of friends, had a blast, had a lot of people discover my writing for the first time, and made a lot of money. What’s not to like? Illegal Alien has also been optioned for TV. Will you have any involvement in the development of the miniseries? I’m attached as Executive Producer. I won’t be writing the script—I wrote that novel in 1996, and going back to re-do it as a script after all these years would, in some ways, feel like a step backward for me. But I’m super-enthusiastic about the project, and really hope it will come to fruition. The director attached to the project, Michael Robison, is terrific, as is producer David Coatsworth. Your current trilogy, WWW, is about the awakening of an internet sentience. In your novel, the Webmind seems benign. Do you believe that any future artificial intelligence will be a benign creation or is the machine dystopia of the Terminator movies more likely? “Any” is the loaded word in your question. No, of course I don’t believe that; it’d be foolish to take that position. What intrigued me was that SF—especially in film and TV—had taken as a given that future AI will be malevolent, and that there’s no way for humanity to survive the advent of things more intelligent than we are. Well, SF is supposed to be about offering choices for tomorrow—and if we don’t have a positive blueprint, then the negative one becomes a self-fulfilling prophecy. Works of science fiction don’t exist in isolation; they’re in dialogue with each other. That my novels Wake, Watch, and Wonder say something different than what everyone else is saying on this topic is precisely what made them worth writing. Religion plays a large part in a lot of your fiction. What early religious experiences (if any) influence your repeated return to the theme of science vs. religion? What is it about religion that is so fascinating to the scientific mind? Actually, the experience came when I was 23. Up until that point, I had a pretty simple worldview, one shared by a lot of SF fans: religious people are self-deluding and stupid. But then, in 1983, with a freshly minted bachelor’s degree in Radio and Television Arts, I was hired to edit the license application for what became Vision TV, Canada’s multi-faith TV channel. And instead of working alongside a bunch of rubes, I found myself working with some really intelligent, thoughtful, scientifically literate, socially aware, well-read people, from across the faith spectrum—Christians, Jews, Sikhs, Muslims, Hindus, and more. These were guys I respected, in most cases, and they believed in something I didn’t believe (and still don’t). That made me want to understand religion not in the straw-man sense that you so often hear it dismissed, but in the sense that can and does attract great thinkers. As it happens, yesterday I just finished reading Amir D. Aczel’s book The Jesuit and the Skull: Pierre de Chardin, Evolution, and the Search for Peking Man. It’s a great portrait of a deeply religious man who thinks very much outside the box, was a staunch evolutionist, and made real contributions to science; Chardin—or, for that matter, my friends Vatican astronomers Chris Corbally and Guy Consolmagno—are such interesting, intelligent guys; you can’t help but be engaged by what they have to say. Immortality and cellular regeneration are also important themes in your novels. It’s been said that the current generation may be the last to age. Is significant life extension a reality you foresee? Oh, for sure; it’s inevitable. Solving aging is an eminently tractable problem, as I said in my novel Rollback. Of course we’ll lick it. Now, will we lick it in what’s left of my life? Who knows; I just turned 50, and I’ve got good Swedish blood, so maybe am only at my half-way mark, even without breakthroughs. Maybe we will, maybe we won’t; I’m not counting on it. But I expect my youngest niece, Abigail, who is six, to make it to 150 at least, if not longer—assuming our civilization doesn’t fall. You’ve written quite a bit about ebook readers. (I’ve recently started using the Kindle app for PC and iPhone and now I’m a total ebook convert.) How do you think (or hope) that ebook readers will evolve? Or do you think individual readers will be abandoned for some iPad-type computer/internet/phone/book reader device? The one advantage of the dedicated ebook reading device is that it doesn’t offer distractions. Reading a book is something you devote time to: we speaking of “settling in” to read a novel, or “curling up” with a good book. With an iPad, or some other general-purpose device, there’s always the temptation to check email, surf the web, play a game, watch a movie, or whatever. That said, I do think e-ink, the most common display technology in dedicated readers, is a dead end: the slow page turns, the inability to backlight the display (which you wouldn’t want all the time, just some of the time), and so on, really turn out to be drags, especially after you’ve tried an iPad. The perfect display technology for long-term reading of text isn’t here yet. Mostly, though, the introduction of ebooks is like the introduction of debit cards. You asked people twenty years ago if they wanted a debit card and everyone said no—why have something that takes the money out of your account right now when your existing credit card lets you buy now and pay later? But the banks were sneaky: everybody did want a card to use automated tellers and happily started carrying those around, and then the banks said, oh, guess what, that card you’re already carrying? It doubles as a debit card. And today, debit cards account for a huge volume of transactions. Same thing with ebooks: all those people who said they love the smell of paper and would never want to lug around a dedicated device are discovering that the phone they’re carrying around anyway is a great book-reading device. It’s a stealth invasion. What’s your current project? What do you have coming up next? I recently finished writing Wonder, the third book in the WWW trilogy; it’ll be out in April 2011. It was the hardest book I’ve ever written—I agonized over it—but I think it turned out well, and, not to be grandiose, but I think it says something important. I do a lot of keynote speaking at conferences, and that keeps me fresh and gives me lots of interesting travel opportunities. I recently did a keynote at the Toward a Science of Consciousness conference in Tucson, I’m off to the Googleplex—the international headquarters of Google—next month, and so on. That said, I do think the central conceit is one of the very best science-fictional notions I’ve ever had, and I can’t wait to dive in and begin writing it. 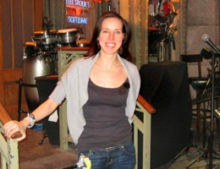 Andrea is a television writer and producer in New York City. Currently, she shares her home with several hundred books, three cats, and a large box of wine.